I’m not sure what to say about this sauce. It is just so magical. It can be used as a pasta sauce, pizza sauce, sandwich spread, nacho dip, chutney, it can be added to stir frys, soups, casseroles…and the list goes on. I don’ know why I just can’t seem to get it exactly like my mum. She made a whole load of it today for my sister in Cape Town. a sprig or two ( or five) of fresh Oregano. Otherwise 2 tsp fresh oregano will do. 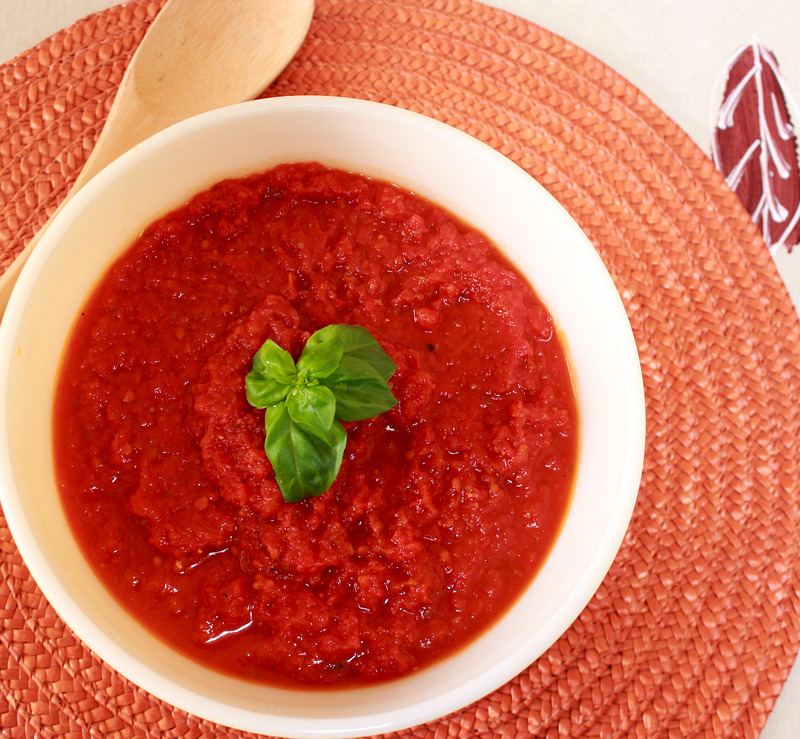 Liquidize the tomatoes, peppers and basil leaves to a medium – fine puree. Depends on how you like it! Heat the olive oil, fry the cumin seeds and the crushed green chilli for 30 seconds. Add the puree, and allow to simmer for ten minutes. Add the black pepper, taj-laving masala,sugar and salt to taste. At this stage I usually need to add more chilli and a drizzle of olive oil, just for fun! Simmer until you notice a change in volume – the sauce should reduce about 1/4. The key to the sauce is the balance between the salt and the sugar. Sounds strange, I know. For those of you who think that fasting on Ekadashi means total hunger and torture, think again! This is my first potato pizza post, but I can assure you that there is a gourmet Ekadashi pizza waiting for you , next Ekadashi. Steam and mash the potatoes. While they’re steaming away, add the cumin and a green chilli to 1 tbsp of hot olive oil in a pan. Once the spices are sizzling away, add the tomato puree. Add salt, pepper and sugar to taste. While the tomato sauce, and the potatoes are on the stove ( it should take about 10-12 minutes), prepare the rest of the ingredients for the pizza. Cut the cherry tomatoes into halves, grate the cheese and crumble the feta. Time saving! Once the potatoes are done, mash in a bowl. Add a tablespoon of olive oil, salt and pepper to taste, and just maybe a touch of green chili. Dont forget to fold in the potato flour. If it is almost impossible to find potato flour, don’t worry, if you leave it out, it’s no big deal. I like to add it for extra crispyness in the base. However, it is not vital! I felt like adding a bit of Parmesan as well. Mix well. 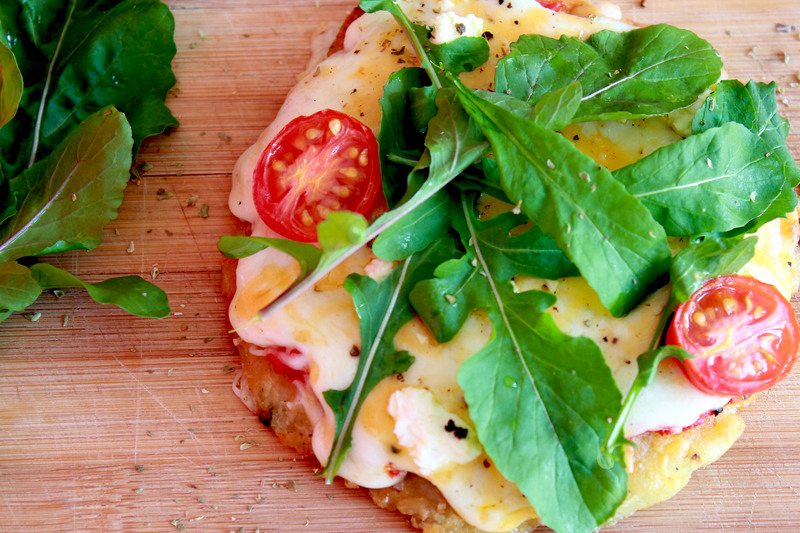 Shape the mashed potato mixture into small sized pizza bases. Arrange on your baking tray and do a final drizzle of olive oil if you wish. Pop them under the grill for 5-7 minutes, to get crispy(ish), manageable potato bases. Once they’re crispy and toasty, spread the tomato sauce over each base. Top with your favourite cheese, cherry tomatos and dry Oregano and grill for a few minutes until the cheese is all gooey and melted! You can always add avo, feta, peppers etc. Have a look in the fridge.